This hockey puck media player will come with a 5V/2A power adapter, an HDMI cable, and USB cable, and a user’s manual. It will run Android 4.4 Kitkat with stock home screen, support OTA function, Miracast, and DLNA. If 4K support is important to you, please note that it’s using HDMI 1.4b which limits the frame rate to 30 fps in UHD resolution. You’d need HDMI 2.0 for 2160p60 support. Price and retail availability is unknown at this point, but Geekbuying will received samples some time next week. You can check Tronsmart Vega S89 page for more pictures. ES8 will be available with either 8 or 16 GB, and miss Bluetooth support and a micro USB port found in Tronsmart Vega S89. Price and availability are not available either. You can check Eny Technology ES8 page for a few more 3D renderings. The company sells the device on Alibaba. The Antutu scores on an early sample of Geniatech ATV1800 was 25,000, and it goes up to over 30,000 on M802 based tablets such as Onda V975m. Rockchip RK3188 based devices only get around 18,000 in Antutu. The higher score is due to a new revision of Cortex A9 core (revision 4) that allows M802/S802 to reach 2 GHz, a much faster 6+2 core GPU, and more memory bandwidth. Another advantage with AMLogic SoCs is that XBMC support is likely to be better than for Rockchip or other silicon vendors’ ARM SoCs. Yes about time, been waiting so long for something better from Amlogic, was thinking it would be much later in the year we see anything. Will these be able to 24p? In theory yes. In practice it looks like the developer community around AMLogic is mostly interested in XBMC Linux, and I can’t remember having seen anybody run a full desktop OS. Can’t wait for XBMC to get full Quad HD / 4K support in skins. XBMC already supports Quad HD / 4K video playback using VAAPI and VDPAU on Linux, but there is not yet support for Quad HD / 4K skin resolutions in XBMC’s GUI engine, so for now you would have to only upscale 1080p skins to Quad HD / 4K resolution. some frameworks as Qt4 and Qt5 with direct framebuffer access don’t have problems. In case you have instructions / documentation that can be made available publicly, I could write a post about Debian / Ubuntu on AML8726-MX. Can anyone tell me what is the best current Android box/stick that I should buy? Should I wait for the Tronsmart Vega S89? Mostly looking for something that can play 720p (at least) or 1080p really smoothly, via wifi if possible. Products based on new SoC often have problems during the first few months, but firmware improves overtime. I’d guess you’ll be able to buy Veg S89 in March, and receive it in April. For video playback many people complained about frame skip issue in RK3188, although there are some fixes in some of the ROMs, but not all… AMLogic AML8726-MX products are usually pretty good at video playback, but 1080p videos maybe not always play smoothly via Wi-Fi. It depends on your setup at home, and the bitrate of the video files you use. In my place, I can play videos up to 8 Mbps without problem via Wi-Fi. If you have high bitrate Blu-ray rips, then I’ve read most (all?) current Android TV box are not really able to cope even via Ethernet. When I tested G-box Midnight MX2, I found it was pretty good, but some people have had issues, and really do not like the device. If you plan to use XBMC, check out xbmc forums. And I build kernel from amlogic sources. I more trust Eny Technology XBMC product. S802 devices will all start to ship at the end of March. Do you have selling link for ES8 or EM8 ? I would have bought this but I can’t help thinking about the Allwinner A80 which is much more powerful and there’s also the good Allwinner community support. Since I don’t care about the GPU the A80 is just fine for server duties. The two devices are listed now at Aliexpress starting at about 100$, search “Amlogic S802”. Some benchmark results (Antutu, passmark, 3dmark, vellamo…) on M802 tablet. Clocked @ 1.6 GHz only. Antutu score is 21800, pretty decent, especially for high res display. 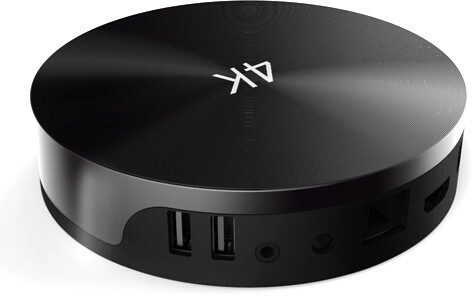 I suppose it should be similar in S802 Android TV boxes. It’s because of Dolby/DTS… If you want pass-through you have to pay up. Not sure if this hard coded in the SoC (e.g. bootROM), or if it is just the firmware, or a combination of both. If you want to decoder you need to pay too. But you maybe right as packing DTS and Dolby to HDMI is really algorithm that cost money and it is standardise . Until a unit with the S802-H chipset is available, I will not be buying. I like the design of the eny M8 and S8, not so keen on the round s89 vega. With a decent wifi chipset in the M8 and bluetooth(same as in the Trosmart) it has almost everything Icould wish for, but until I have seen a review and confirmed DD+DTS passthrough I will be holding off on buying. Hopefully with the next generation of kit, we will get proper 4k with HDMI2.0, gigabit LAN and USB 3 connections. I would pay $250 for a device like that.